please, let us know and ask for a full resolution originals for printing. See and pik up the DOCUMENTs of the International Theological Commission, below, at the bottom of this page. - You can access VOICES also at GlobeTheolLib, the Global Digital Library on Theology & Ecumenism, (enter «Journals» and choose V for VOICES). VOICES-2018-1 (2'8 Mb). «Medellin, 50 years later». 166 pp. 11 Authors: Luiz Carlos SUSIN and Geraldina CÉSPEDES (orgs. ), Eduardo HOORNAERT, Víctor CODINA, Raúl ROSALES, Rosemary Fernandes DA COSTA, Marcelo BARROS, Diego IRARRÁZAVAL, Luis INFANTI, José Maria VIGIL, Carlos Alberto Motta DA CUNHA e Geraldo DE MORI. VOICES-2017-2 (2'5 Mb). «Liberation Theology in Europe». 300 pp. 15 Authors: Stefan SILBER and José María VIGIL (orgs. ), Cordula ACKERMANN, Franco BARBERO, Bento Gonçalves DOMINGUES, Josef ESTERMANN, Benjamín FORCANO, Philipp GEITZHAUSE, Bruno KERN, Julia LIS, Luis MARTÍNEZ SAAVEDRA, Bernhard OFFENBERGER, Felice SCALIA, Peter Schönhöffer and Santiago VILLAMAYOR. Original release: 1.0, December 28, 2017. VOICES-2017-1 (2 Mb). 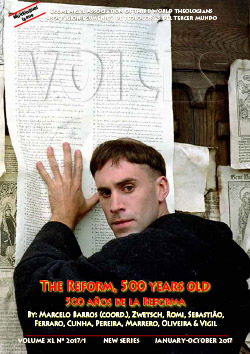 «The Reform, 500 years Old». 316 pp. 12 Authors: Marcelo BARROS (org. ), Roberto ZWESTCH, Romi Márcia BENCKE, Debastião Gameleira SOARES, Benedito FERRARO, Magali do Nascimento CUNHA, Diego PEREIRA, Luis Carlos MARRERO, Claudio de Oliveira RIVEIRO and José ARREGI. Original release: 1.0, October 15, 2017. VOICES-2016-2 (2'7 Mb). 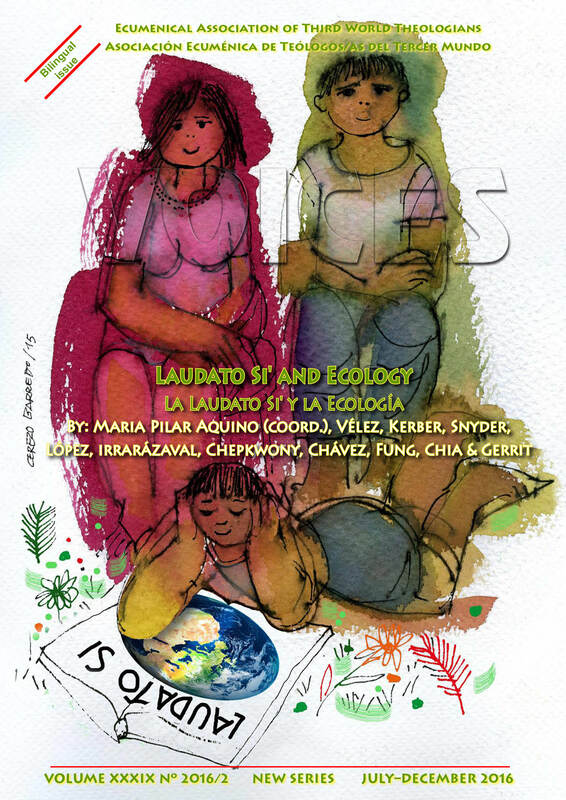 «Laudato Si' and Ecology». 204 pp. 10 Authors: Maria Pilar AQUINO (org. ), Olga Consuelo VÉLEZ CARO, Guillermo KERBER, Joshua R. SNYDER, Eleazar LÓPEZ HERNÁNDEZ, Diego IRARRÁZAVAL, Adam K arap CHEPKWONY, Joso M. FUNG, Edmund CHIA and Emanuel GERRIT SINGGIH. Dossier edited by María Pilar AQUINO. Original release: 1.0, December 19, 2016. VOICES-2016-1 (2'7Mb). 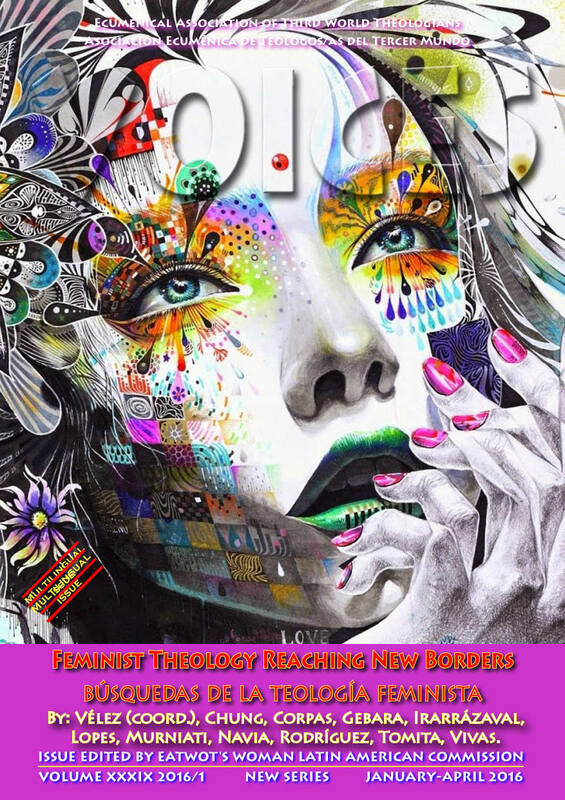 «Feminist Theology Reaching New Borders». 226 pp. 10 Authors: Olga Consuelo VÉLEZ CARO (org. ), Meehyung CHUNG, Isabel CORPAS DE POSADA, Ivone GEBARA, Diego IRARRÁZAVAL, Mercedes LOPES, Agustine NUNUK MURNIATI, Carmiña NAVIA, Mary Betty RODRÍGUEZ MORENO, Socorro VIVAS and Luiza E. TOMITA. 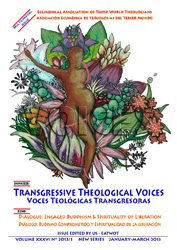 Dossier edited by the Latin American Woman Theological Commission of EATWOT, coordinated by Olga Consuelo VÉLEZ CARO . Original release: 1.0, March 1, 2016. VOICES-2015-3&4 (3Mb). «The New Archaeological-Biblical Paradigm». 356 pp. 11 Authors: Silas Klein CARDOSO, Israel Finkelstein, Antonio Carlos FRIZZO, Pedro Paulo FUNARI, José Luiz IZIDORO, Ademar KAEFER, Élcio Valmiro Sales de MENDONÇA, Luigi SCHIAVO, José María VIGIL and Santiago VILLAMAYOR. Dossier edited by the International Theological Commission of EATWOT . Original release: 1.0, November 1, 2015. Take a multilingual Presentation of the New Archaelogical-Biblical Paradigm - Tome una Presentación bilingüe del Nuevo Paradigma Arqueologico-Bíblico. VOICES-2015-2 (2Mb). 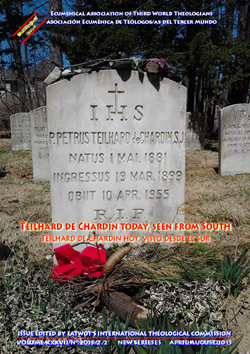 «Teilhard de Chardin Today, Seen From South». 182 pp. 9 Authors: Jorge Nicolás ALESSIO, Federico BATTISTUTTA, Frei Betto, Maria Clara Lucchetti BINGEMER, Roger HAIGHT, Agustín DE LA HERRÁN GASCÓN, Carles James dos SANTOS, Jojo M. FUNG, Luiz Alberto Gómez DE SOUZA and Roberto TOMICHÁ..
Dossier edited by the Latin American Theological Commission of EATWOT.. Original release: 1.0 of April 1, 2015. VOICES-2015-1 (2'5Mb). 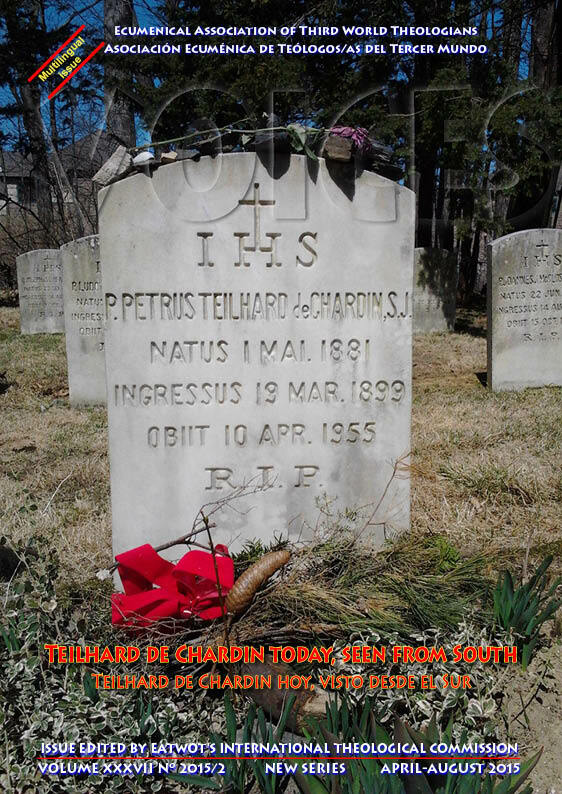 «Teilhard de Chardin International Conference in Asia». 250 pp. 16 Authors: Kathleen DUFFY, Thomas MENAMPARAMPIL JOWAI, Jacques ARNOULD, Ursula KING, M.D. JOSEPH, Leopold RATNASEKERA, Patricia Simone do PRADO, Marcelo BARROS, Magali do Nascimento CUNHA, Michel SCHLESINGER, Jose Maria VIGIL, Karina Arroyo Cruz Gomes de MENESES, Adnan Abdallah El SAYED, Luiz Carlos SUSIN and EATWOT's International Theological Commission. Dossier edited by Shirely Lal Wijesinghe, Sri Lankan EATWOT. Original release: 1.0 of February 15, 2015. See the cover. Take an offprint of the Dossier on Inter-religious Dialogue. Tome una separata del Dosier sobre Diálogo Inter-religioso. Prenez vous une copie du Dossier pour le Dialogue Inter-Religieux. VOICES-2014-4 (3Mb). 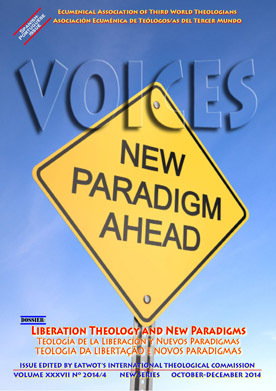 «Theology of Liberation and New Paradigms». 188 pp. 16 Authors: João Batista LIBÂNIO (†), Carlos MESTERS, Francisco OUROFINO, Juan Bosco MONROY, Hugo CÁCERES, Paulo SUESS. José Luis CARAVIAS, Carlos MENDOZA-ÁLVAREZ. Simón Pedro ARNOLD, Marcelo TREJO, Etienne A. HIGUET, Héctor LAPORTA, Nancy CARDOSO PEREIRA, Carlos M. CAMPS CRUELL and Reinhard KIRSTE. 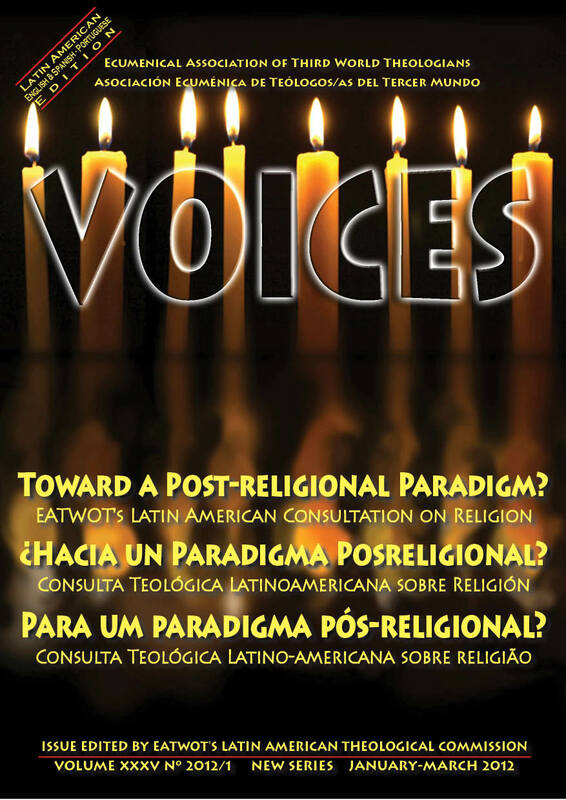 Issue edited by EATWOT's Latin American Theological Commission. Original release: 1.0 of December 31, 2014. VOICES-2014-2&3 (3Mb). Double issue. «Deep Ecology, Spirituality and Liberation». 434 pp. 20 Authors: Richard RENSHAW. Lee CORMIE, José ARREGI, Aníbal CAÑAVERAL, Sofía CHIPANA QUISPE, Rui Manoel GRÁCIO DAS NEVES. Jojo M. FUNG, Sandro GALLAZZI. Karl GASPAR, Ivone GEBARA, Marcelo GLEISER, Roger HAIGHT, Erwin KRÄUTLER, Dietmar MÜSSIG, Nancy CARDOSO PEREIRA, Fábio Py DE MURTA, Leandro SEQUEIROS, Helena RECH, José María VIGIL, Birgit WEILER. 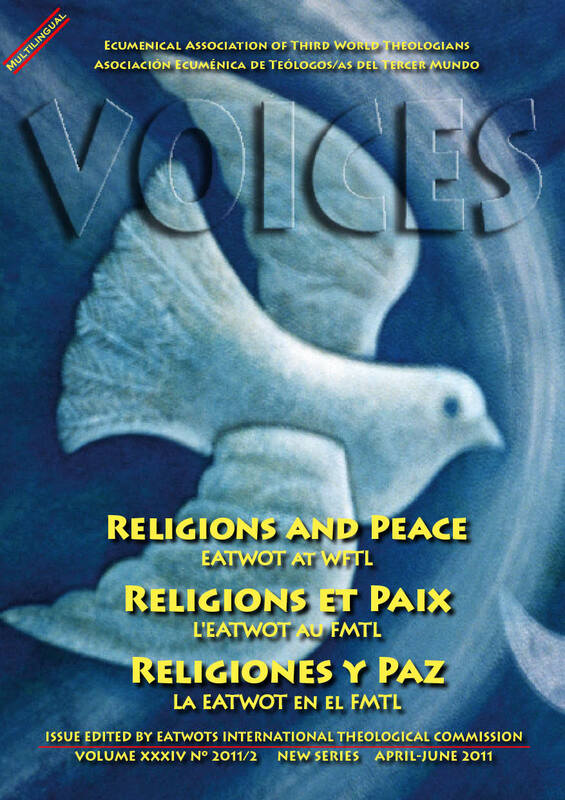 Issue edited by EATWOt'sInternational Theological Commission. Presentation & Index. Original release: 1.0 of September 30, 2014. VOICES-2014-1 (2'5Mb). 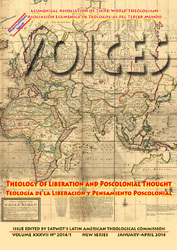 «Liberation Theology and Poscolonial Thought». 174 pp. 7 Authors: Simón Pedro ARNOLD, Marcelo BARROS, Diego IRARRÁZAVAL, Jojo M. FUNG, Héctor LAPORTA, Juan Bosco MONROY and Biblical Pastoral Reading Team of Perú, and Stefan SILBER. 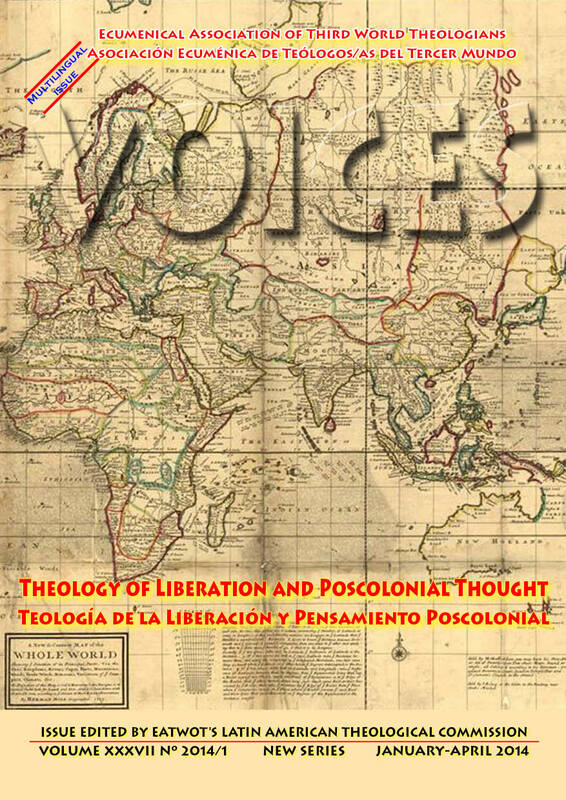 Issue edited by Latin American Theological Commission. Original release: 1.0 of April 30, 2014. VOICES-2013-4 (2'5Mb). 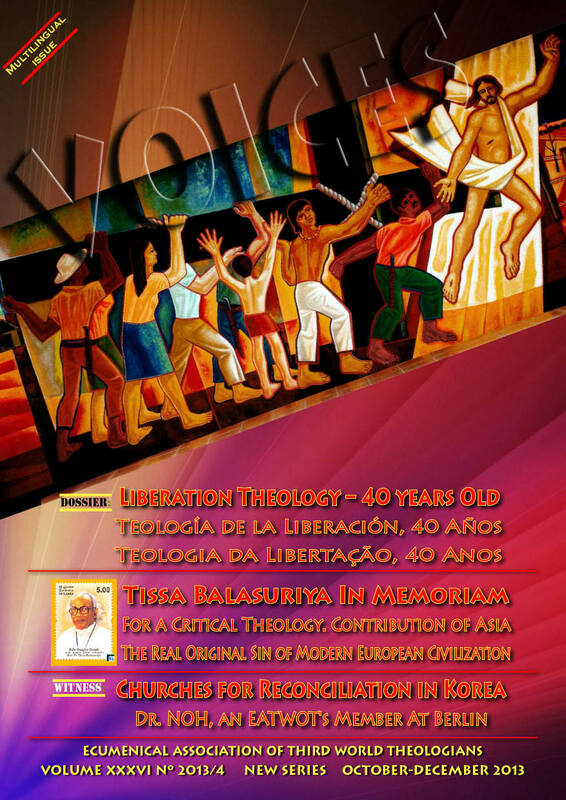 «Liberation Theology, 40 Years Old». 222 pp. 14 Authors: Luiz Carlos SUSIN, Antonio José de ALMEIDA, Gilbraz De SOUZA ARAGÃO, Marcelo BARROS, Luigi SCHIAVO, Sergio Néstor OSORIO, Roberto TOMICHÁ, Olga Consuelo VÉLEZ, Guillermo KERBER, Jorge E. CASTILLO GUERRA, José María VIGIL. Dossier edited by Latin American Theological Commission (Third Latin American «Minga» for Theological Journals). Most of articcles of our dossier were published in Latin American Theological Journals: see a partial register. VOICES-2013-2&3 (2Mb). Double issue. «Ecological Vision in a Groaning World». 147 pp. 7 Authors: Catherine JENDIA and Therese TINKASIIMIRE, Charles MOYWAYWA, Martin KIPKERICH TANUI, Adam K. arap CHEKWONY, Hazel O. AYANGA, Jojo M. FUNG. VOICES-2013-1 (2'5Mb). «Transgressive Theological Voices». 180 pp. 12 Authors: Gerald M. BOODOO, Rufus BURNETT Jr, Michel Elias ANDROS, Nami KIM, Phillip J. LINDEN Jr, Joseph DREXKER-DREIS, Leandro DURAZZO, Faustino TEIXEIRA, Marcelo BARROS, Rui Manuel GRÁCIO DAS NEVES, EATWOT's Latin American Theological Commission, Pedro CASALDÁLIGA. VOICES-2012-3&4 (2'7Mb). Double issue. «Towards a Work Agenda for Theology». 198 pp. 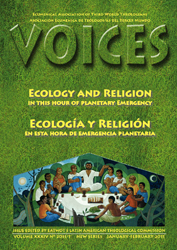 9 Authors: EATWOT's International Theological Commission, Juan José TAMAYO, Geraldina CÉSPEDES, Denise COUTURE, Jean RICHARD, Giuseppe RUGGIERI, Gerald BOODOO, Vito MANCUSO, José María VIGIL. 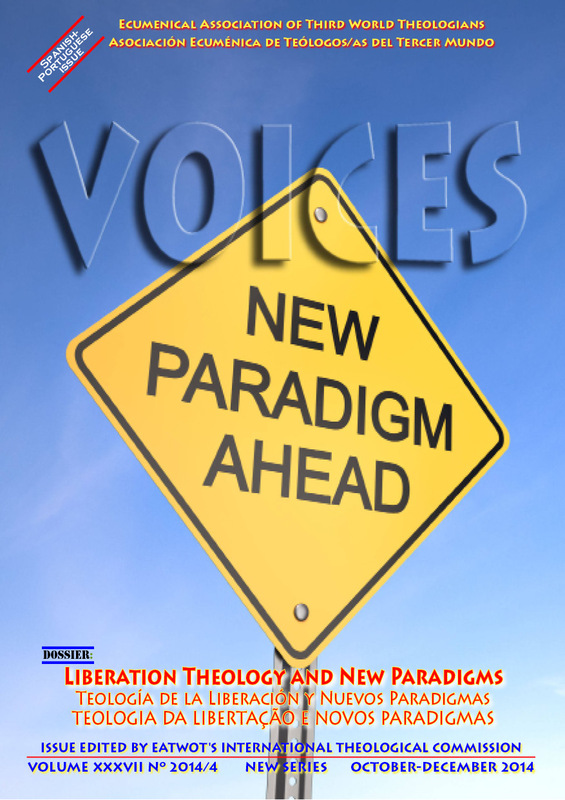 Issue edited jointly by WFTL (World Forum on Theology & Liberation) and the International Theological Commission of EATWOT. VOICES-2012-2 (2'3Mb). 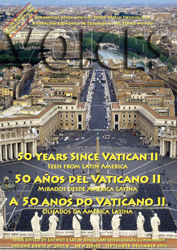 «These five great decades», 50 years from Vatican II in Africa and Asia». 140 pp. 13 Authors: Carmelo ÁLVAREZ, Edmund CHIA, José DUQUE, Antonio EGIGUREN, Maria JIAO, Anthony J. KELLY, Sergio LORENZINI, Kazubiro MORI, J.N.K. MUGAMBI, Albert NOLAN, Jorge PIXLEY, José Amando ROBLES, Shirley Lal WIJESINGHE. 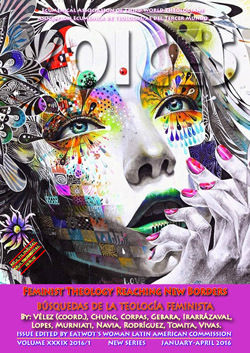 Issue edited by the International Theological Commission of EATWOT (Second Latin American «Minga» for Theological Journals). Original release: 1.0 of June 25, 2012. VOICES-2012-1 (2'6Mb). «Towards a Post-Religional Paradigm?». 350 pp. 16 Authors: Gilbraz ARAGÃO, Víctor CODINA, José COMBLIN, Josef ESTERMANN, Ivone GEBARA, Rui Manuel GRÁCIO DAS NEVES, David MONTEALEGRE, Alejandro ORTIZ, Juan Diego ORTIZ, José Amando ROBLES, Luigi SCHIAVO, Sinivaldo TAVARES, Tissa BALASURIYA, Marià CORBÍ, EATWOT's International Theological Commission. 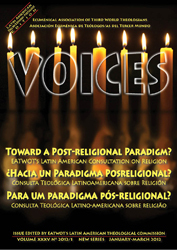 Issue edited by the Latin American and the International Theological Commissions of EATWOT. Take the «Theological Proposal» in a multilingal text (in English, Spanish, Portuguese, Italian, French and German), or only in Spanish, or only in English. VOICES-2011-4 (2'8Mb). 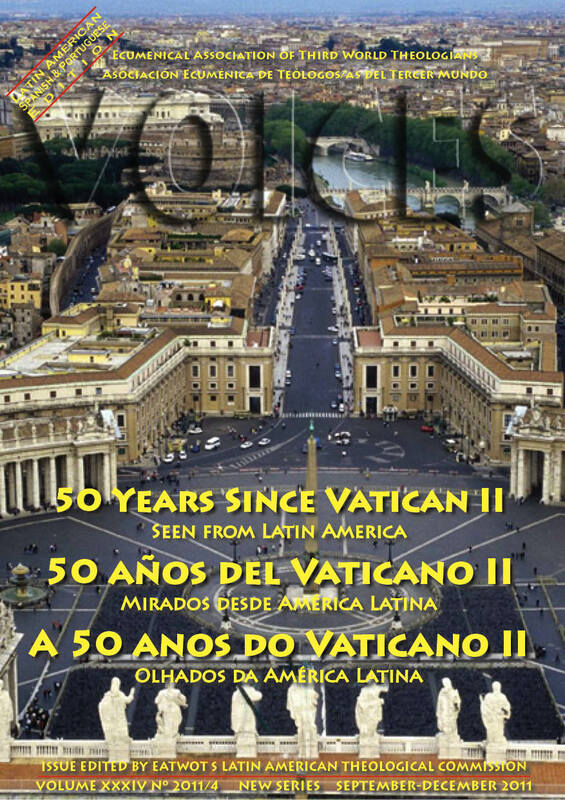 «50 Years Since Vatican II. Seen from Latin America». 313 pp. 16 Authors: Tomás BALDUINO, Marcelo BARROS, Antônio CELSO DE QUEIRÓS, Geraldina CÉSPEDES, Victor CODINA, José COMBIN, Cecilio DE LORA, Julio DE SANTA ANA, Eduardo HOORNAERT, Claude LACAILLE, Alberto DA SILVA MOREIRA, John O'MALLEY, Alberto PARRA, Consuelo VÉLEZ, José María VIGIL, Georgina ZUBIRÍA. Latin American Spanish & Portuguese edition. Several text in Italian. 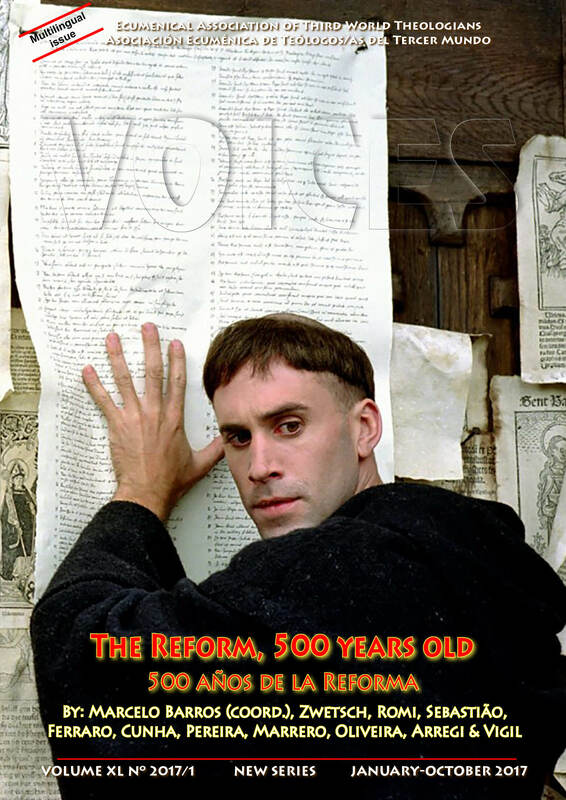 Issue edited by the Latin American Theological Commission of EATWOT. VOICES-2011-3 (4Mb). 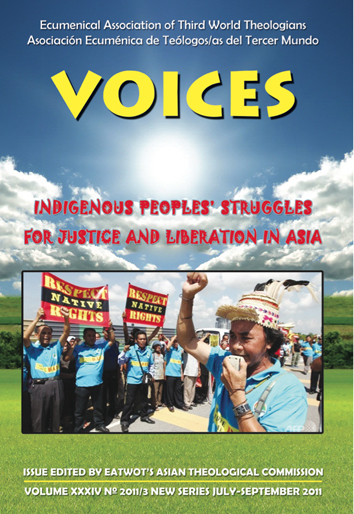 «Indigenous Peoples' Struggles for Justice and Liberation in Asia». 75 pp. 6 Authors: Karl GASPAR, Martin ADHIKARY, Mario SARDI, Jong SUN NOH, Noel FERNANDO, Hannah Chen. 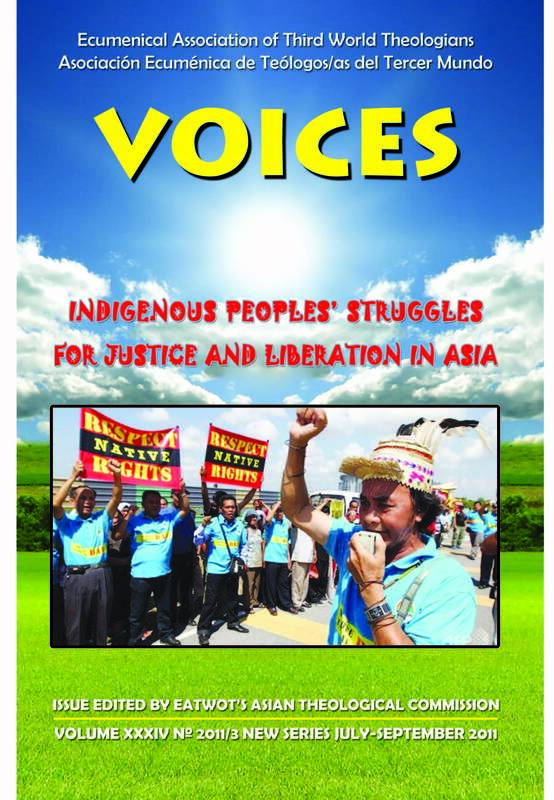 Issue edited by the Asian Theological Commission of EATWOT. Original Release 1.0 of February 10, 2014. VOICES-2011-2 (2'7Mb). «Religions & Peace. EATWOT at World Social Forum and World Forum on Theology and Liberation». 376 pp. 28 Authors: International Theological Commission, Léon DIOUF, Abdoul AZIZ KEBE, K.L. SESHAGIRI RAO, John CHENG WAI-LEUNG, David R. LOY, Ralph DEXTER, Saila Kuna IGUANABIGINIA, Hans UCKO, Reinhard KIRSTE, Faustino TEIXEIRA, Stefan SILBER, José María VIGIL, Edmund CHIA, David ROSEN, Serge M. TRAORE, Leonard SWIDLER, John HICK, Andrés TORRES QUEIRUGA, Teresa OKURE, Jeannette LONDADJIM, Kochurani ABRAHAM, Geraldina CÉSPEDES, Diego IRARRÁZAVAL, Jaume BOTEY. Multilingual edition: English, French, Spanish, Portuguese and Italian. Issue edited by the International Theological Commission. VOICES-2011-1 (2'2Mb). 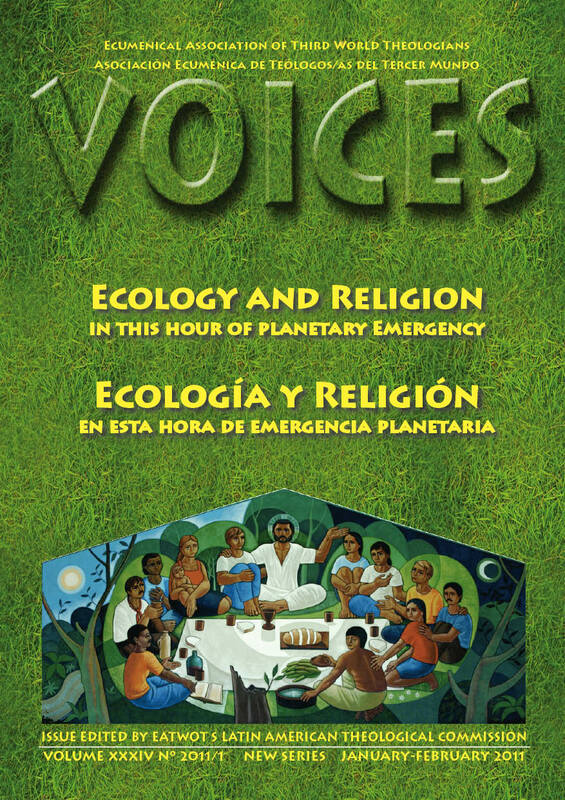 «Religion and Ecology in This Hour of Planetary Emergency». 326 pp. 20 Authors: Marcelo BARROS, Leonardo BOFF, Pedro Celso CAMPOS, Jorge E. CASTILLO GUERRA, José Manuel FAJARDO SALINAS, Ludovico GARMUS, Manuel GONZALO, Rui Manuel GRÁCIO DAS NEVES, Antônio MOSER, Afonso Tadeu MURAD, Ignacio NÚÑEZ DE CASTRO, María Inés RESTREPO, José Raúl SUÁREZ ALFONSO, Joan SURROCA i SENS, Faustino TEIXEIA, José María VIGIL. Trilingual edition: English, Portuguese and Spanish edition. 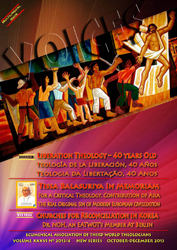 Issue edited by the Latin American Theological Commission (First Latin American «Minga» for Theological Journals). 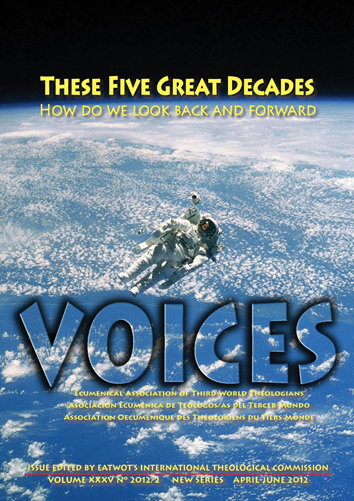 2010 There was no publication of VOICES in this year. 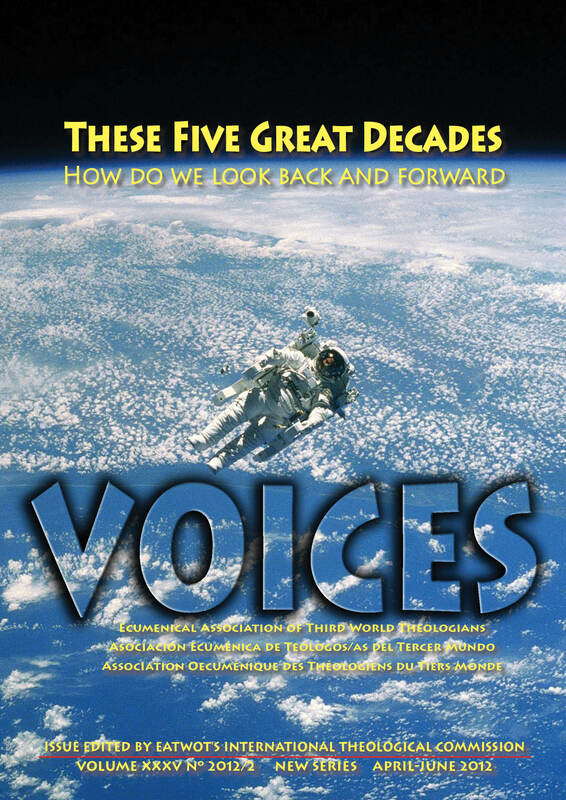 VOICES-2009-June (1'8Mb) . «Eco-Crisis Theological Visions». 11 authors. 135 pp. Issue edited by Rohan SILVA, Marlene PERERA and Shirley Lal WIJESINGHE. 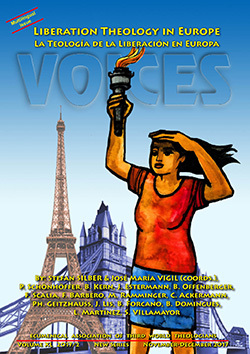 VOICES-2006-December (2'1Mb). «Sixth General Assembly of EATWOT, Johannesburg, July 2006». 119 pp. vol.XXVIII VOICES-2005-June (2'3Mb). «Theology for Another Possible World», 9 authors, 160 pp. 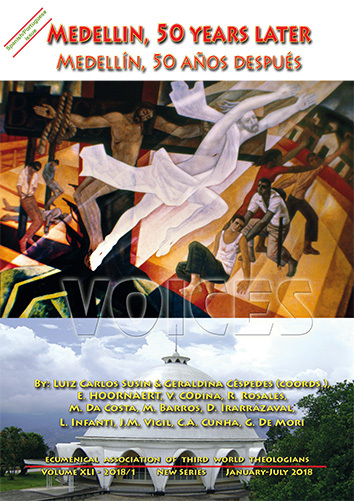 vol.XXVII VOICES-2004-June (2'1Mb). «New Challenges to EATWOT's Theology», 7 authors, 147 pp. 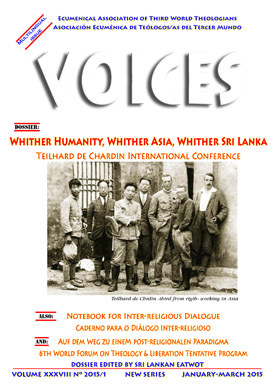 vol.XXII VOICES-1999-December (2'8Mb). «New Just World Order», EATWOT's General Assembly held at Tagaytay, Philippines, December 1996, edited by K.C. Abraham, 214 pp. 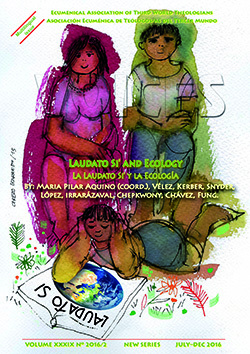 Document on Ecological Vision and Planetary Survival (370 kb, in English & Spanish).